Few months ago, a tutorial was published ArykTECH. The tutorial discussed how to generating BlackBerry IMEI using a Windows program. As simple as it was, some people could still not generate valid BlackBerry IMEI using that program. Some don't have PC to be used for generating the IMEI and therefore would either Whatsapp or email me for BlackBerry IMEI. Well, I think I can now rest a bit more, at least; on generating IMEI for you guys since you can now generate thousands of BlackBerry IMEI on your own using your Android device. 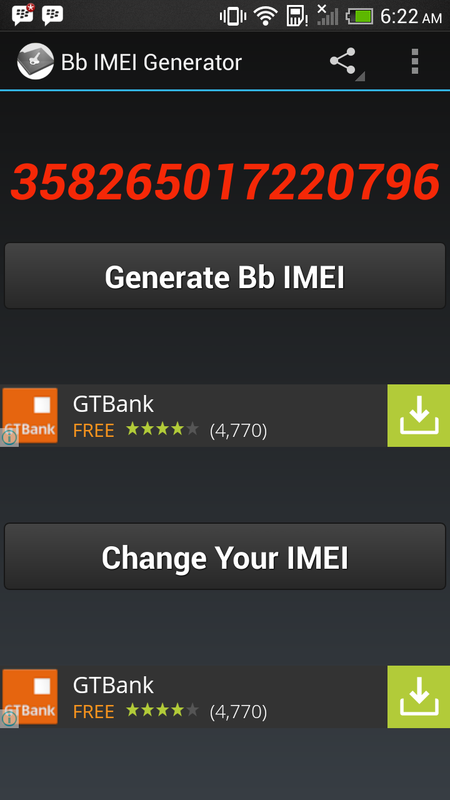 Generating BlackBerry IMEI on your Android device is as simple as just tapping your Android device's app drawer. 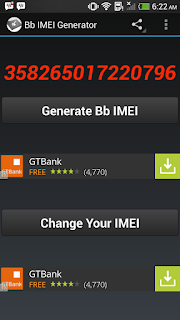 To start generating BlackBerry IMEI on your Android device, all you have to do is to download and install the BlackBerry IMEI Generator apk from this link here and install it on your Android device. To generate IMEI, simply open the application, click Generate BB IMEI. And valid BlackBerry IMEI will begin to displaying right above. NOTE: you may tap Generate BB IMEI as many times as you want to generate different IMEI, or as many BlackBerry IMEI as you may want. If you have any questions or concerns, use the comment box below.